The process of manually transporting and decanting substances from drums is a physically exhausting and time consuming task for employees to carry out. Physically manoeuvring and manipulating these heavy and unwieldy drums, which often contain hazardous or toxic chemicals is a dangerous and inefficient process. 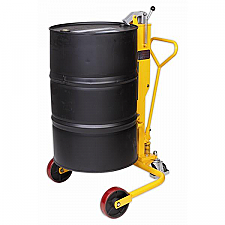 Due to this drum handling equipment is increasingly becoming commonplace within working environments which frequently move and handle drums. The implementation of these items within a workforce has been shown to increase employee efficiency whilst also increasing workplace safety. Implementing the correct piece of drum handling equipment into a workplace ensures that a task which would otherwise be cumbersome, dangerous and time consuming becomes quick, efficient and most importantly safe for the employees involved. Handling Equipment Online is committed to providing items of handling equipment which increase levels of efficiency and safety within the workplace. This commitment has manifested in a large range of drum handling implements which includes models to meet the specific requirements of any drum handling scenario. In drum transportation situations where no tipping or decanting is required, Handling Equipment Online has a wide range of options. These options include drum porters and drum overrides. For situations where tipping and decanting of the drum is required, Handling Equipment Online has a number of drum tippers and drum tipping lifters. These items enable recipients to safely and effectively decant and tip drum as and when is required. The range of drum handling equipment which is available from Handling Equipment Online also includes a number of forklift attachments. Utilising drum handling equipment within a warehouse, factory or logistic centre setting has been consistently shown to reduce the number of accidents and incidents within the workforce related to stress induced injuries. These injuries frequently occur when workers attempt to manually move and manipulate heavy, cumbersome and dangerous drums on a frequent basis. However it is not only the safety of the employee which is greatly increased with the use of drum handling equipment, these items also improve the safety of the product itself. This is because when drum handling equipment is used there is a much lower chance of costly damage to the product due to improper manual handling. Handling Equipment Online has an extensive selection of drum handling equipment in order to match the specific requirements of each client. For further information regarding this range, a member of Handling Equipment Online’s expert technical team can be contacted on 01384 895 859. This entry was posted in Uncategorized and tagged drum handling equipment on January 28, 2014 by admin.